There are so many different forms of Angels, and they all help us with different areas of our lives. We don’t need to know who we are talking to, or know their specific names to let them help us. But we do need to ask for their help. Due to free will, they cannot help us, unless we ask. So we need to remember to ask them for help! You can even say, Angels, please help me to remember to ask for your help. 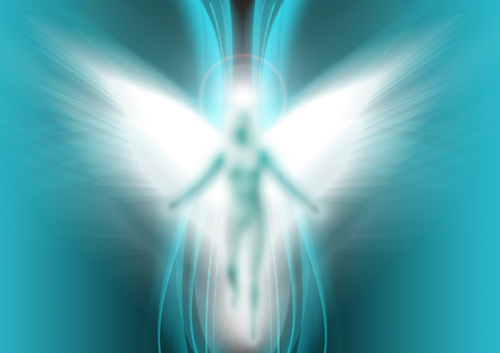 When calling in an Angel, it doesn’t need to be a specific invocation and take ages and sit in meditation or at an alter – whilst of course we can do this – we simple need to think – Angel’s please help me with this situation – and immediately they can go to work for you. The other factor here is, calling in ‘pure’ Angels. To be safe, you can always add to the calling of your Angels – ‘Angels, of 100% light, please help me with this situation.’ – that way, you know you are receiving help from the highest vibration and your best interests at heart. Angels, are not also from just the spirit worlds. I am sure that you have heard, “They turned up, and it was just like an angel had been sent to help me.” Angels appear in real life people as well. Sometimes they turn up, help you and you never see them again, or they may be a mentor or some other person in your life that you look up to. I remember not so long ago, I had some sad news, that my ex didn’t want to be in relationship with me anymore. It was like a bombshell was dropped on my lap, my whole world shattered before 8am that day. I was upset and an emotional mess. That morning, I had a man booked into to come and fix the rollers on my doors and windows of the house. He turned up and I tried to hide my sad feelings and tears. And I thought I did well at that! Yet, before he left, he asked me if I was okay and that he didn’t like seeing me upset. I told him briefly the story. He then began to tell me his life story (briefly), and how that I need to remember that the only person that can make me happy is myself and that my life will get better even though it didn’t seem like it this minute in time. I was like – err who is this man telling me all this! Yet, I knew, he was a human angel, sent to help me that day, to help me get through one of the most difficult times of my life. He shared with me his artwork (photos on his phone), and how that he did it for a hobby, it kept him busy and helped him through the break up with his long term relationship. He realised that he couldn’t help her anymore, she didn’t want to be helped and it was the hardest thing he had to do was walk away from her. But he learnt that no one can make anyone happy – that is an inside job. He asked me which of his artwork I liked. About 2 days later, I got home from being out, and sitting on my doorstep was the piece of art I pointed out. It was a painting on a piece of timber, with the words that said, “To be truly happy, the only person you need to love is yourself and never change anything that you like about yourself.” I was overwhelmed with his kindness that day he fixed my doors – which mind you – he didn’t end up charging me for! Let alone, such a powerful symbol of being able to let go and trust that truly, everything that unfolds, really is for the best, even though at times, it doesn’t seem like it. That Angels do exist and can turn up in Human form when we need them the most. I have not seen this man again, nor heard from him. But his piece of artwork sits on my alter as a powerful reminder that Angels do exist, and that powerful piece of truth, that to be happy I just need to love myself, that is all. Angels can turn up in the form of animals as well. They may randomly cross your path when you most need that hug of a dog’s unconditional love, or the message from the Eagle soaring above you, to remember to look at the big picture. Animal Angels, may be in the form of our own pets and are there to remind us of the powerful force of unconditional love that exists everywhere, if we only open ourselves to see it. There are many different types of spiritual angels, from Archangels to healing angels, to helpful angels in the areas of home, finances, career, romance or otherwise, and I encourage you to research what Angel can help you best at this time. If you would like a message from your Guardian Angel – your Angel that is assigned to your from your birth into this world and will be there until you leave this world, give me a call or text chat and we can see what your Guardian Angel is trying to say to you. This entry was posted in Angel and tagged angels on May 10, 2016 by Hannah.